"THE CROOKED BUNCH...locked in a living hell-hole!". 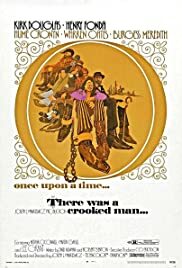 There Was a Crooked Man is a 1970 western comedy starring Kirk Douglas and Henry Fonda and directed by Joseph L. Mankiewicz. The film follows Paris Pitman (Douglas), a charismatic criminal who ends up in jail, and his attempts to escape the prison of warden Lopeman (Fonda).